The province of Avila is home to the Sierra de Gredos - some of Spains most attractive mountains providing some magnificent walking terrain. The first parador in Spain was sited by Alfonso XIII to have a view of the main peaks. The city of Avila, the highest provincial capital in Spain is totally encircled by a 2.5km long city wall, possibly the best preserved in the country. 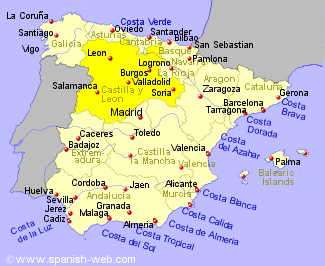 This largely agricultural province in the north east of the region has nearly half it's population living in the capital city of Burgos. The landscape of the province of Leon is characterised by plains to the south and east and bordered by mountains to the north (part of the Picos de Europa) and west. The fertile plains of the province grow an expanse of cereal crops and provide grazing for livestock with a large number of rivers providing irrigation. Another largely agricultural province with ceral growing plains to the south and mountains on the northern borders. The countryside is sparsely populated with nearly half the population of the province living in the capital city, Palencia. Situated against the Portugal border, west of Madrid, Segovia province has a green and rolling countryside with a large number of reservoirs, including the 85Km long Embalse de Almendra, one of the largest in Spain. Lying just north of Madrid, the province of Segovia has an altitude (height above sea level) of between 750 and 2500m. It is a province of castles, medieval churches and roman aqueducts.